Hi, my name is Marko Petkovic. 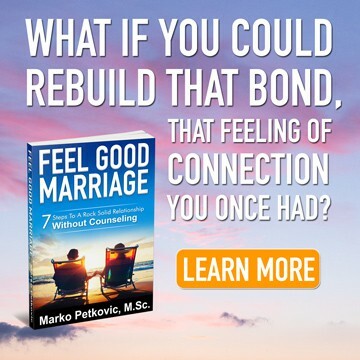 I am a best-selling author, publisher and creator of feelgoodrituals.com. I help motivated but overwhelmed people who struggle balancing their professional work with raising kids while trying to be good partners. Hence, my goal is simple but not easy—to help you achieve a healthy and fulfilling marriage, have meaningful influence on your children and ultimately achieve the life you always wanted. A few years ago, my wife and I almost lost hope. Things were not right, and we almost walked away. Thankfully, we scraped and dug our way out without any professional counseling. 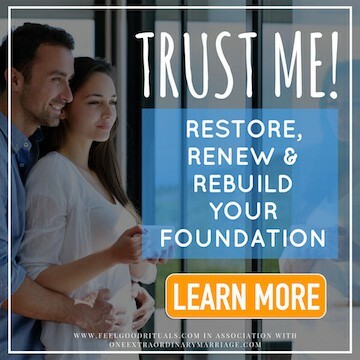 We found a way to tear down those walls between us and rediscover that connection we once had (and still have) and our marriage is now something we hold precious, and protect. 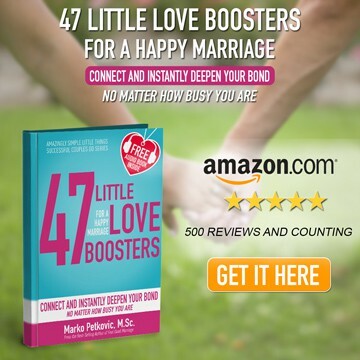 Inspired by our success, I wrote an Amazon Best Sellers Feel Good Marriage, the 47 Little Love Boosters for A Happy Marriage, and my last book The 5 Little Love Rituals. Here’s something I’m going to tell you right up front, so even if you stop reading this blog, you’ll walk away with one very important message. Embarrassingly, my wife and I found out about this simple truth only after many unnecessary struggles. In other words, it’s your habits that help you achieve goals and live the life you’ve always wanted. Sure, successful couples love each other deeply, but they don’t rely on loving feelings to come naturally. They create them. Moreover, they create them consistently, by taking daily action. 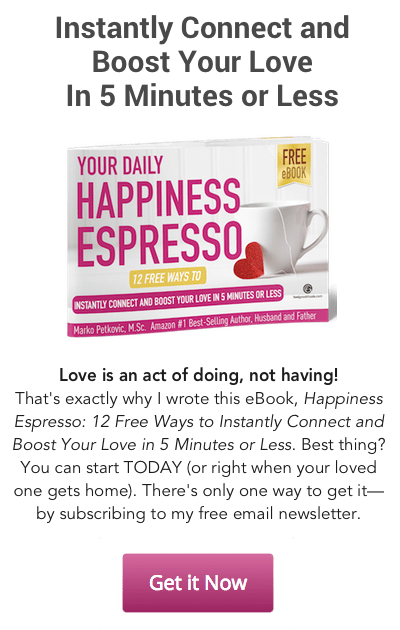 No matter how many books and blogs you may read, it all comes down to how often you can create loving feelings for yourself and the ones you love. Most of the habits that we develop in life are just useful for our everyday lives. Some are healthy, like brushing your teeth in the morning, but many are only for convenience, or efficiency. They’re important, but some habits deserve a bigger place in our hearts. When we practice them we feel good about ourselves, our marriage, and our relationship with our children. The results are magical. Do you want a bite of that magic for yourself? I normally publish two posts per month, although this may change in the future. To make sure you don’t miss my newest posts, you can subscribe via e-mail. After being so fortunate to be able to gather strength and push through the stormy times in our marriage, my wife and I looked back. From today’s perspective, it feels almost embarrassing how simple things can be with just a pinch of common sense, some knowledge, and a dash of loving and caring discipline. I believe keeping things simple is a good thing. You are more likely to start doing and keep on doing things in life that are simple. We’re all more likely to have success that way. This blog is about those simple things. The nice little things in life that cost no money but matter the most. If you want to start creating your own magic too, sign up and start getting this blog right into your inbox today! I’ve been happily married to my wife, Natalia, since September of 2000. But you already know that we weren’t always that happy. Actually, we almost divorced. But what we’ve learned in overcoming our problems enables me to understand those of you who are experiencing the same things. I’m also the father of two boys. 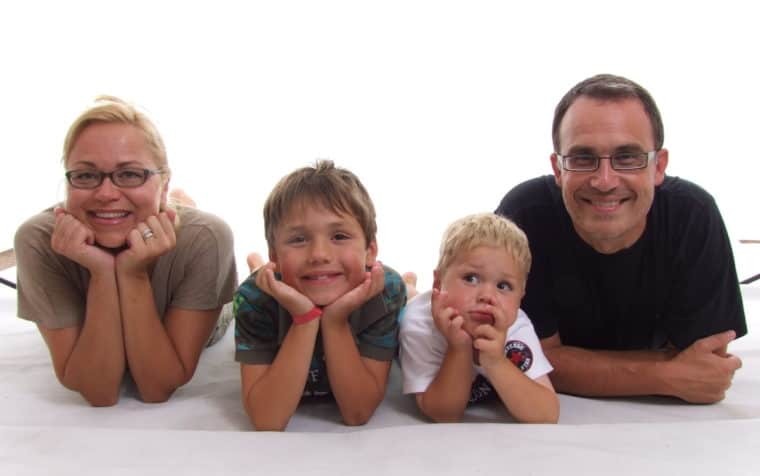 And similar to our marriage, our parenting journey hasn’t been (and still isn’t) without its fair share of challenges, but we are growing through them and I’m writing about this here on my blog and in my books. That being said, I would like to consider myself to be a kickass husband and father, but I still screw up every now and then. When this happens, I say to himself, “Tomorrow, I’ll do better,” and see those everyday challenges as inspiration for my own work.